Whisky Live is a whisky festival where people can taste a selection of different whiskies at the ticketed price of $99. The venue for Whisky Live Melbourne 2014 was the St Kilda Town Hall, where about 100 whiskies sat waiting for a horde of thirsty whisky drinkers no doubt keen to get their moneys worth. This year, I attended Whisky Live Melbourne on Friday 18 July 2014 and tasted (a little too many of) the whiskies on offer. On my first glance at all the whiskies on offer for tasting my feeling of excitement quickly faded. While vast, the selection of whiskies on offer was predictable and mostly reflected what is available at Dan Murphy’s (which is certainly good but hardly pushes the boundaries). An “Old and Rare” bar was available offering for sale measures of, you guessed it, old and rare whisky (a concept I struggled to understand particularly because it cost $99 to get into the venue in the first place and, last I checked, most bars don’t have a $99 door charge). There was also a Duty Free section featuring various Travel Retail whiskies and an interesting stall set up by the bar Whisky & Alement, but hardly anything to prompt curiosity and excite the senses in any significant way. That said there were notable brands missing – Laphroaig, Sullivan’s Cove, Nant, Ardbeg, Macallan, and Glenmorangie weren’t there, and despite NZ Whisky Co being listed on the Whisky Live Melbourne website not a single Kiwi whisky passed my lips that night. I swooped on expressions that I had not tasted for a while or those with which I was not intimately familiar. The selection of whiskies on offer – despite being so predictable – was vast and included some expensive expressions available for tasting, including the delectable Glenlivet XXV. I only got a chance to taste these expressions properly towards the end of the evening, because by that stage the venue was less crowded and I was able to finally get my whisky glass noticed! There was also plenty of food available to match with whiskies or to help clear the palate, though the best of it was very quick to vanish. Overall, Whisky Live Melbourne was a fun way to spend Friday night. For those who are relatively new to the whisky world Whisky Live seems like an exciting event that provides a great opportunity to explore different whiskies available on the Australian market. For the whisky enthusiast already familiar with Whisky Live, that $99 may be better spent at a specialist whisky bar buying nips of whatever poison tickles your fancy. 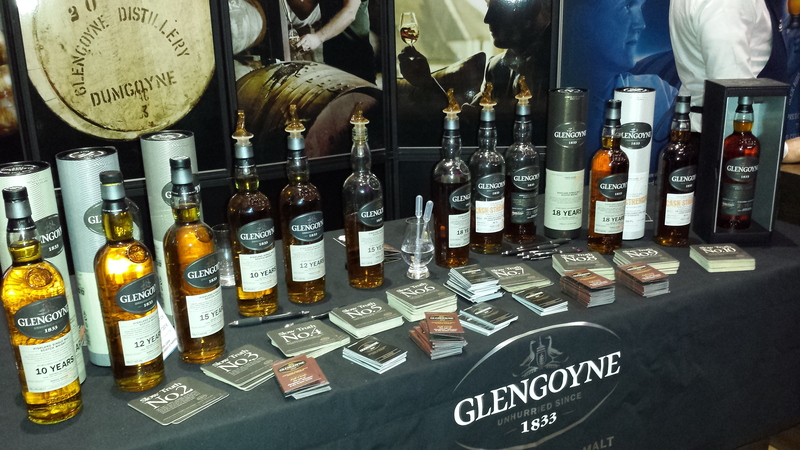 This entry was posted in Uncategorized and tagged Melbourne, whisky festival, Whisky Live Melbourne. Bookmark the permalink.